Emperor Franz Joseph has many claims to fame, not least the establishment of the Austro-Hungarian empire. But he seems to have been a bit of a famous eater, judging by the number of traditional dishes associated with him. Kaiserschmarrn is one. Tafelspitz another. Amusingly, the food much loved by the Emperor was often very basic, where the fine decoration was left to the tableware and napkins. Take Tafelspitz, for example. Essentially, it’s just boiled beef. Now you can pick and prod at the recipe as much as you like, and embellish it with all sorts of little extras. But it all comes down to a piece of beef, boiled. And yet Tafelspitz carries an air of imperial grandeur here. It’s a bulwark of Viennese tradition that conjures up images of more reliable times. When beef was beef and real men wore moustaches you could hide an elephant in. Or not. Anyway, it’s certainly a Viennese dish for special occasions, for dinner parties or a holiday celebration. It’s even the flagship dish on the menus of some of Vienna’s most refined restaurants, such as Plachutta on the Wollzeile. The Tafelspitz is also the name of the specific meat joint, cut from the rump, with a characteristic layer of fat on one side. If there’s no fat, it’s not Tafelspitz. The meat is boiled in simmering water until very soft and tender, along with soup greens and/or soup cubes. In fact, the leftover broth is typically used as a soup before the meat course. 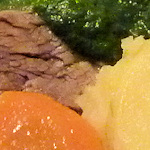 Then you serve the boiled meat in slices, accompanied by a range of possible side dishes, all of which err on the “hearty” side of the culinary palate: horseradish, apple sauce, creme spinach, potatoes, cabbage, chive sauce, etc.. In restaurants, you may find Tafelspitz comes in the pot, ready sliced, but still immersed in its warming, flavoursome broth until you remove it. According to the Austrian government (who take their meat very seriously), the dish may have first appeared in Hotel Sacher sometime around the middle/end of the 19th century. And, yes, that’s the Hotel Sacher of Sachertorte fame. You’ll find Tafelspitz on many restaurant menus, but usually at the more expensive end, thanks to the cost of the prime ingredient and the time taken to prepare it.